A frothy cup of Oishi Oishi beef broth cools on the bench outside. The Bone Broth mania has finally arrived on the Upper West Side. It has been nearly four years since Chef Marco Canora first opened Brodo out of the kitchen window of his East Village restaurant Hearth. That launched a fascination with the healing power of this carnivorean essence. 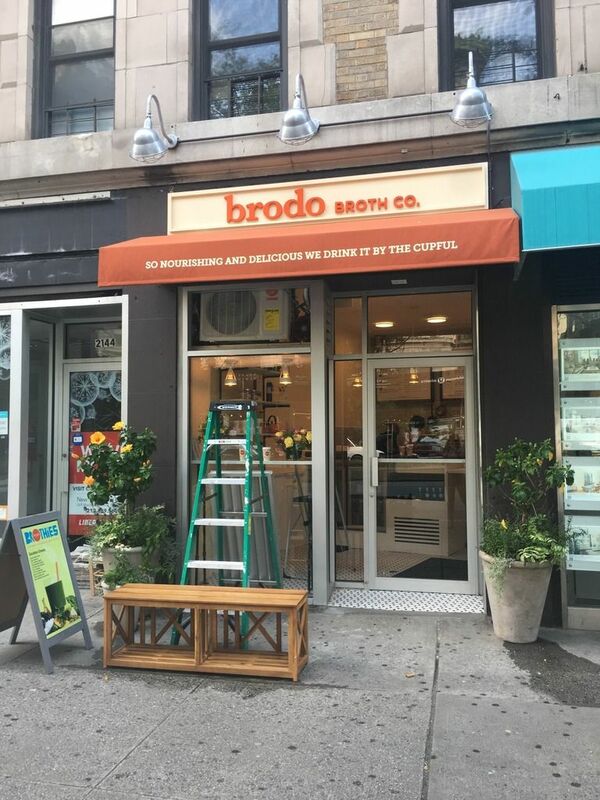 But it wasn’t till last Friday that Brodo Broth Co. seeded itself in my zipcode on Broadway in the 70s. Though I heard raves for bone broth as it gained popularity I had never bothered to give it a try. I set out for a sampling Tuesday just before lunch. With a ladder sitting in the window, tools dominating the only usable counter space inside, and an empty cold case, the place looks like they’re still trying to open. Ingredients are scattered messily on the counter. Though it has yet to be polished Brodo's exterior is warm and inviting. Studying the menu and the abundance of posters decorating the walls, it’s clear the pitch is focused on health and quality. Informational cards in the corner suggest that good bone broth can imitate the effects of Botox and also stifle one’s imagined need for caffeine. 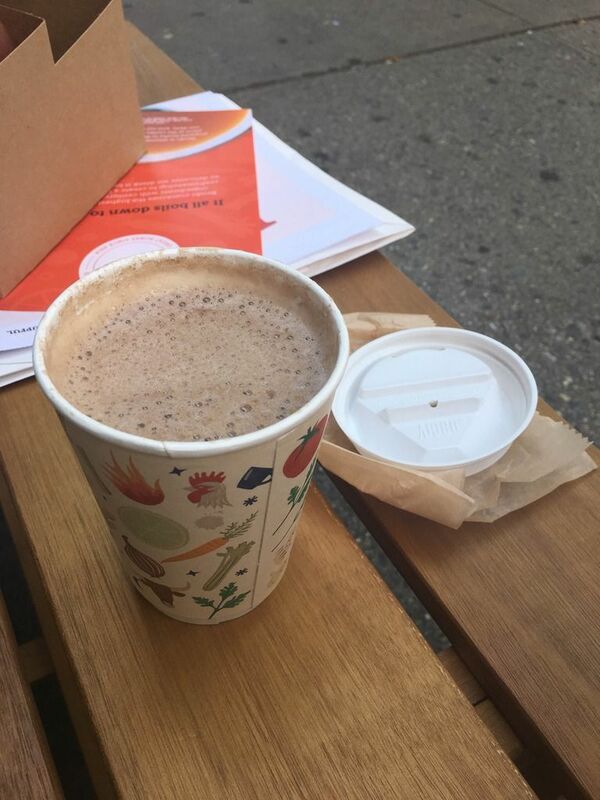 “Yeah right,” I think: New Yorkers will abandon their coffee. The house produces four core broths and suggests a multitude of add-ins, ranging from bone marrow to Calabrian chili oil. An employee offers me a sample of the 100% natural grass fed beef broth, pouring it from one of the many taps behind the counter. Pleasant and distinctly beefy in flavor, it’s still delicate enough to sip on a warm summer day. 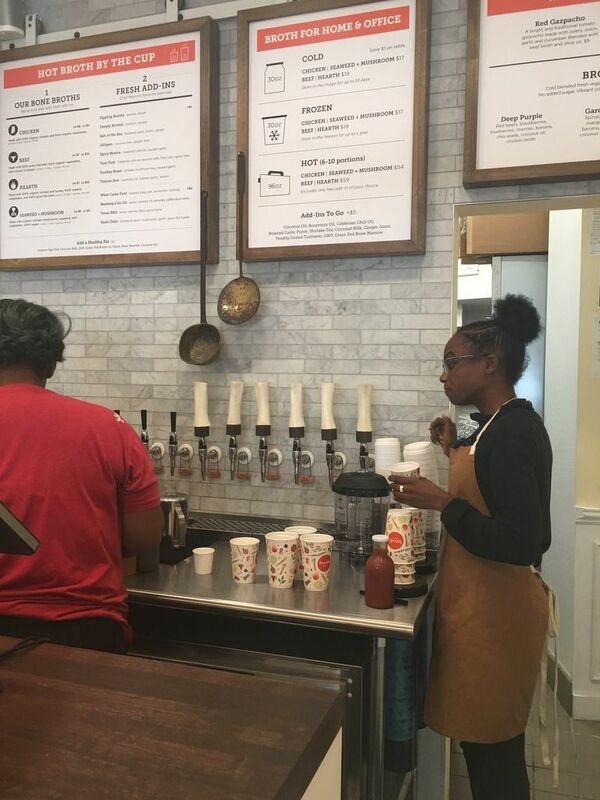 Employees are still being trained on the job, learning to work the taps and blend drinks. I ask to try the Brodo Oishi Oishi, She pours another ration from the tap and stirs in essences of mushrooms, garlic and butter. 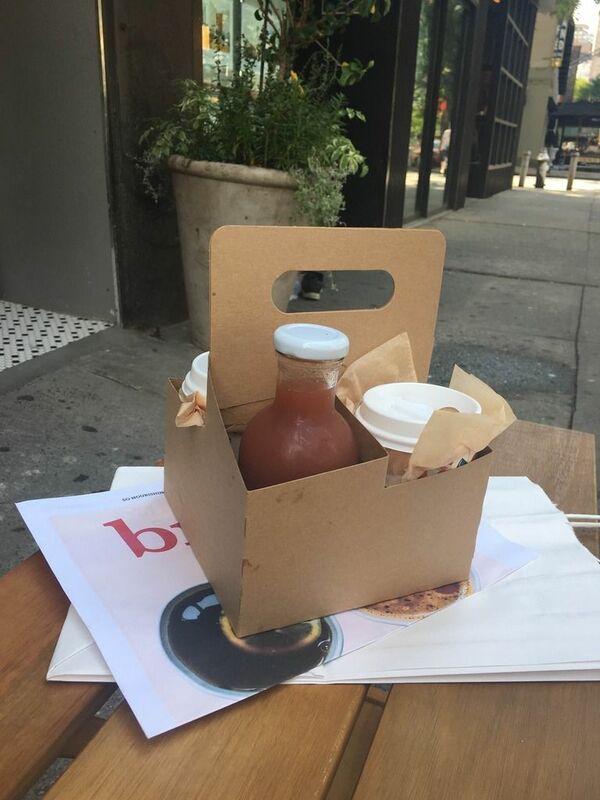 Brodo's beverages are built for travel, sittting in a carrier box to avoid spilling. I actually prefer the unadulterated beef broth to the Oishi mix. I miss the classic vegetable texture of gazpacho. The hearth broth is my favorite sip. I like the combo of distillations --vegetables, turkey, beef and chicken. Still, the truth is brodo is not enough for me. In an hour or so I’ll be on the hunt for my next snack. 2114 Broadway, between 75th and 76th Streets. Telephone 646 858 1494. Open Monday-Friday 8am-8pm, Saturday and Sunday 10am-8am.